This three-day course has been designed to provide a comprehensive and practical update of diagnostic surgical pathology. It is primarily designed to enhance the knowledge of practicing surgical pathologists, particularly those involved in community practice. 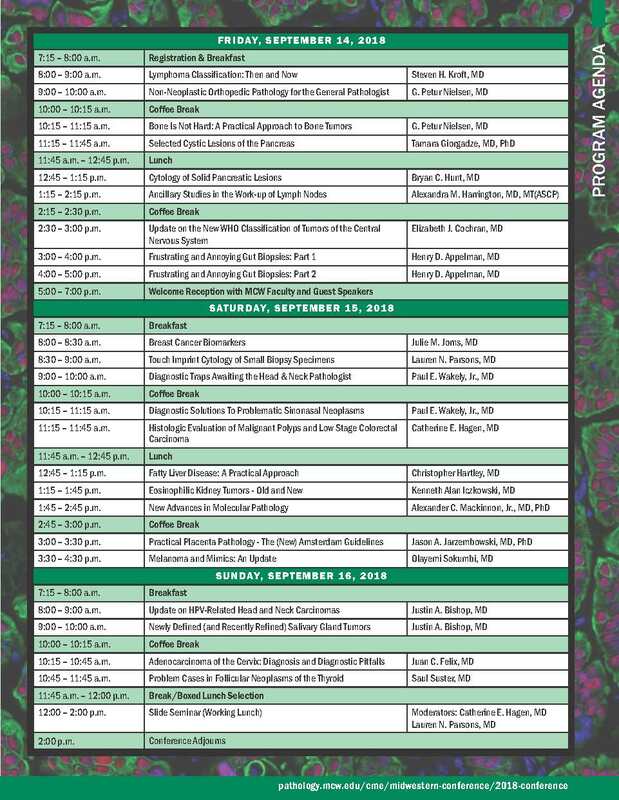 This activity will include lectures containing the latest in research and diagnosis, and complex surgical pathology cases, each session providing time for questions and answers. Case presentations are selected to highlight unusual presentations of rare and common conditions, to demonstrate key points in diagnosis and potential pitfalls, and will emphasize application of evidence-based medicine and up-to-date references. The Medical College of Wisconsin, as the sole medical teaching institution in Southeastern Wisconsin considers it a responsibility to offer community physicians CME programs that will help them update their skills in their specialty and acquire new medical knowledge. There is currently no other program of its kind being offered for pathologists in the state of Wisconsin. Support for the need and desirability of such a program has been reinforced through informal conversations held between the members of the planning committee and pathologists in the community. This course is applicable to practicing surgical pathologists, surgeons, oncologists and pathologists-in-training. Healthcare professionals who work in other areas of research and surgical pathology will also find this course beneficial. Onsite overnight hotel accommodations are available through Hilton Milwaukee City Center. Reservation Details: Please reserve your lodging accommodations directly through the Hilton Milwaukee City Center. All guest room reservations require a credit card guarantee. Cancellations within 48 hours of arrival and no-shows will be charged one night’s room and tax. Check-in time: 3:00 p.m. / Check-out time: 12:00 p.m. Discounted self-parking is available for $12 per car, per night in the Hilton’s parking structure. The parking structure entrance is located on N. 5th Street between W. Wisconsin Avenue and W. Michigan Street. Program attendees without overnight accommodations are also eligible for the $12 per day event parking rate; however please note a new fee will apply to each entry into the lot. Unlimited in-and-out privileges are available to overnight guests only. Valet parking is not available. Alternate nearby structure/surface/street parking options, availability and rates vary. Determination of educational content for this program and the selection of speakers were the sole responsibility of the planning committee. While unlikely, the agenda, topics and presenters are subject to change due to unforeseen circumstances. The Medical College of Wisconsin designates this Live activity for a maximum of 20.0 AMA PRA Category 1 Credit(s) ™. Physicians should claim only the credit commensurate with the extent of their participation in the activity. The Medical College of Wisconsin designates this activity for up to 20.0 hours of participation for continuing education for allied health professionals. The Medical College of Wisconsin is a provider for Self-Assessment Modules as defined by the American Board of Pathology, and has designated this educational activity for a maximum of 12.0 SAM credits. ** MCW Affiliates, to receive discount, contact Shannon Majewski before registering on-line. * Fellows/Residents/Students must submit a letter from your program director verifying your status to: Shannon Majewski, Course Coordinator via fax: (414) 805-6980 or e-mail: midwesternconference@mcw.edu and you will be given a coupon code to receive the discounted rate. Requests for cancellation must be submitted in writing. Cancellations postmarked on/before August 13, 2018 will receive a full refund, less a $50 processing fee. No refund will be granted for cancellations postmarked after August 13, 2018. Fees will not be refunded for no-shows. The Medical College of Wisconsin reserves the right to cancel this course due to unforeseen circumstances. In the event of cancellation, all registration fees will be refunded in full. The Medical College of Wisconsin will assume no financial responsibility or obligation for any related costs including, but not limited to, airfare, lodging and other travel expenses. Please note: Google Chrome and Mozilla Firefox are the preferred browsers.